The human body is composed of just four basic kinds of tissue: nervous, muscular, epithelial, and connective tissue. Connective tissue is the most abundant, widely distributed, and varied type. It includes fibrous tissues, fat, cartilage, bone, bone marrow, and blood. As the name implies, connective tissues often bind other organs together, hold organs in place, cushion them, and fill space. Connective tissue is distinguished from the other types in that the extracellular material (matrix) usually occupies more space than the cells do, and the cells are relatively far apart. Fat is an exception, having cells in close contact with each other; but with large, nonliving, intracellular lipid droplets, fat contains much more nonliving material than living material. The matrix of connective tissue typically consists of fibers and a featureless ground substance. The most abundant fiber in connective tissues is a tough protein called collagen. Tendons, ligaments, and the white stringy tissue (fascia) seen in some cuts of meat are composed almost entirely of collagen, as is leather, which consists of the connective tissue layer (dermis) of animal skins. Collagen also strengthens bone and cartilage. Elastic and reticular fibers are less abundant connective tissue proteins with a more limited distribution. The ground substance may be liquid, as in blood; gelatinous, as in areolar tissue; rubbery, as in cartilage; or calcified and stony, as in bone. It consists mainly of water and small dissolved ions and organic molecules, but the gelatinous to rubbery consistency of some tissues results from enormous protein-carbohydrate complexes in the ground substance. The hard consistency of bone results mainly from calcium phosphate salts in the ground substance. bloodstream in fibrous connective tissues); macrophages (large phagocytic cells descended from certain leukocytes); erythrocytes (red blood cells, found only in the blood and bone marrow); chondrocytes (cartilage cells); and osteocytes (bone cells). 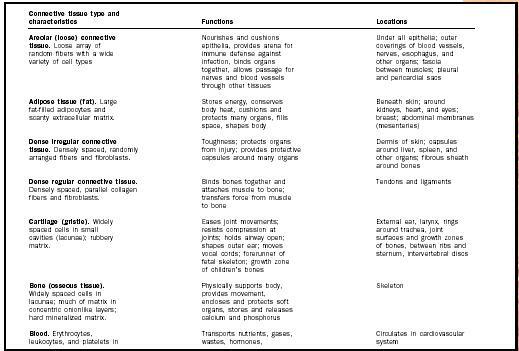 The table above lists representative locations and functions of the major types of connective tissue. Further details on connective tissue can be found in textbooks of histology and human anatomy. Gartner, Leslie P., and James L. Hiatt. Color Textbook of Histology. Philadelphia, PA: W. B. Saunders, Co., 1997. Ross, Michael H., Lynn J. Romrell, and Gordon I. Kaye. Histology: A Text and Atlas, 3rd ed. Philadelphia, PA: Lippincott Williams & Wilkins, 1994. Saladin, Kenneth S. Anatomy & Physiology: The Unity of Form and Function, 2nd ed. Dubuque, IA: McGraw-Hill Higher Education, 2001.